Job searching is very difficulty in present days situation. So to make job searching easy we provide some tips and tricks to search the jobs on our page. Are you looking for Complex SQL Queries jobs? We provide you with the complete Complex SQL Queries interview Question and Answers on our page. To be precise SQL (Structured Query Language) SQL (Structured Query Language) is a standardized programming language used for managing relational databases and performing various operations on the data in them. There are numerous leading companies that offer various job positions in SQL like Urgent Requirement for DataStage, Strong SQL concepts, SQL Database Developer - SQL Server, .Net Developer -SQL Server, SQL Developer, SQL Developer - MS Visio/t-sql, Software Engineer-PL/SQL, SQL Server Developer, Microsoft SQL Server Developer, MS SQL MSBI Developer and many more. So, to know more about Complex SQL Queries Interview Question and Answers and for various positions please visit our site Wisdomjobs.com. Question 1. Query To Find Second Highest Marks Of A Student? Based On the Below Student table We are Written All the Queries. Question 2. Query To Find Duplicate Rows In Table? Question 3. What Is The Query To Fetch First Record From Student Table? Question 4. What Is The Query To Fetch Last Record From The Student Table? Question 5. What Is Query To Display First 4 Records From Student Table? Question 6. What Is Query To Display Last 3 Records From Student Table? Question 7. What Is Query To Display Nth Record From Student Table? Question 8. How To Get 3 Highest Marks From Student Table? Question 9. How To Display Odd Rows In Student Table? Question 10. How To Display Even Rows In Student Table? Question 11. How Can I Create Table With Same Structure Of Student Table? Question 12. 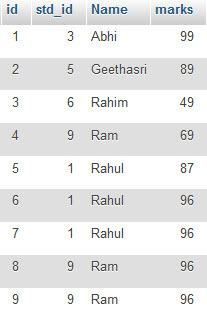 Select All Records From Student Table Whose Name Is ‘abhi’ And ‘geethasri’.